After missing eight games with a concussion, Penguins winger James Neal returned to the lineup on Saturday in Pittsburgh’s regular season finale vs. Carolina at CONSOL Energy Center. All he wanted to do this evening, said Neal, was get back up to game speed and ramp it up for the playoffs. 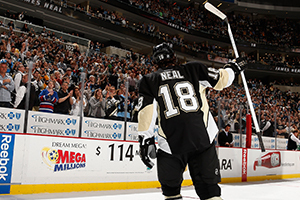 WATCH NEAL'S HAT TRICK HERE! He may not have been expecting a lot in his first game back after a lengthy layoff, but Neal ended up playing arguably his best game of the season. Not only was he flying out there, but he scored his third career hat trick (and added an assist for a four-point performance) in a 8-3 win over the Hurricanes – giving him a total of 21 in 40 games. Neal has now reached the 20-goal mark in all five of his NHL seasons. Neal credited the work he did with strength coach Mike Kadar to stay conditioned during his recovery and skating with injured stars Sidney Crosby and Paul Martin as to why he was able to have a game like he did tonight after a few weeks away from action. Neal also finished with a game-high eight shots, with his deadly release was on full display. Neal had a hot start to this shortened season with 17 goals in his first 26 games, but had just one goal in 13 games before suffering the concussion on April 5 against the New York Rangers. So having the kind of game he had tonight after that paired with being out for a few weeks will do a lot for his confidence heading into next week’s playoffs. Neal played right wing next to center Evgeni Malkin, with Chris Kunitz rejoining the two of them on the left side. The three of them spent a lot of time together last season with Sidney Crosby out, and they picked up right where they left off on Saturday. Malkin earned the primary assist on two of Neal’s goals, while Kunitz got secondary assists on two of them as well.